Retargeting is the ability to target those that have interacted with your business before with ads. 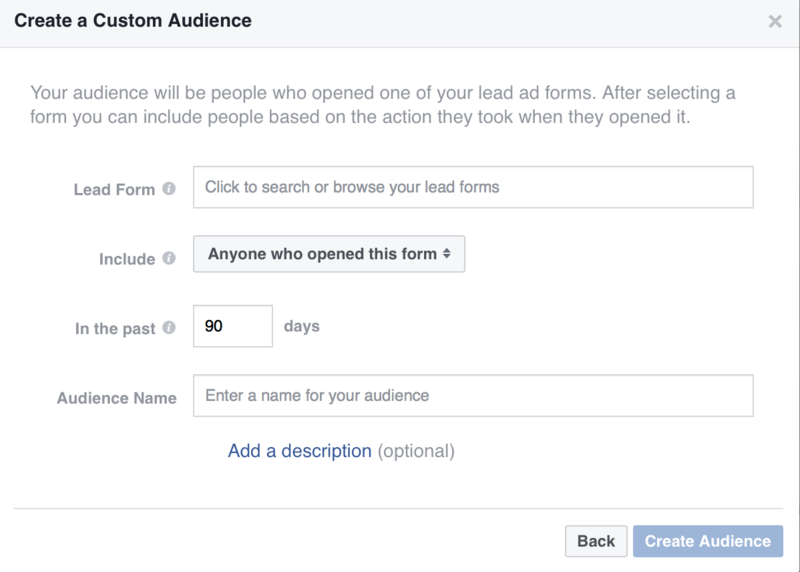 The groups above will be your “custom” audiences and they are critical to your return-on-investment with Facebook Ads. 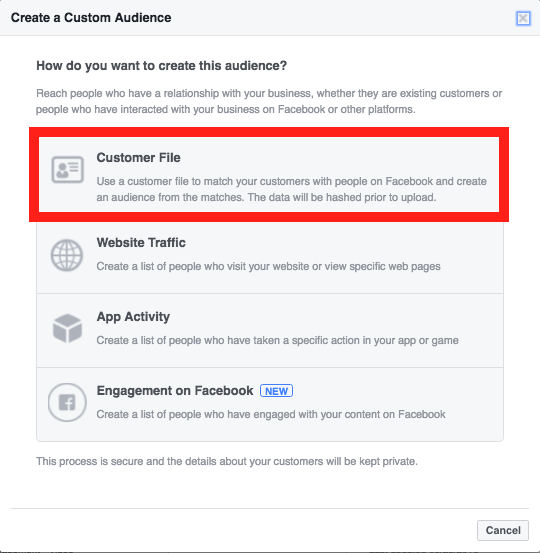 Custom audiences are Facebook's way of sorting your online store visitors so that you can serve highly tailored ads to them. You can also make custom audiences even more narrow by using exclusions (the “and” targeting with Chapter 4’s suggestions, or “excluding” certain groups of people/other custom audiences). The more specific you get, the more effective your campaign will be. 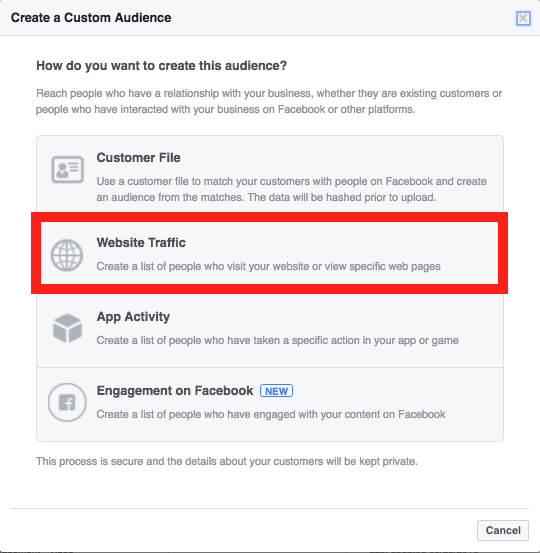 There’s so much to say on Custom Audiences, our team even wrote a 50-page Facebook custom audiences guide, but here are the basics. Customer data such as emails and addresses are great ways to start building your custom audience. As you collect the data in your online store, you can upload the information to Facebook so that Facebook recognizes when these shoppers use the social network. As long as they’re using the same contact information on both platforms, you’ll be able to serve highly targeted ads. Remember though, you need permission to manage their data. Don’t upload random lists of addresses. It’s here that you can capitalize on all the new traffic you brought in by using the techniques in Chapter 5. You can also consider timing of a potential customer’s visits. You can advertise to anyone who visited in the past 180 days (at a maximum) - or you can be more selective and only show ads to visitors from the past 30 days, 14 days, 7 days, etc. It’s up to you! And even the amount of time someone has spent on your website. For merchants who have an app, you can create a Custom Audience based on people who have used your app. For merchants using Shopify’s SDK, this is huge! For example, you can target people who previously used your app, but have not come back to your app within the last month. Or you can target people who have added an item to their cart on your app, but never went on to purchase it. 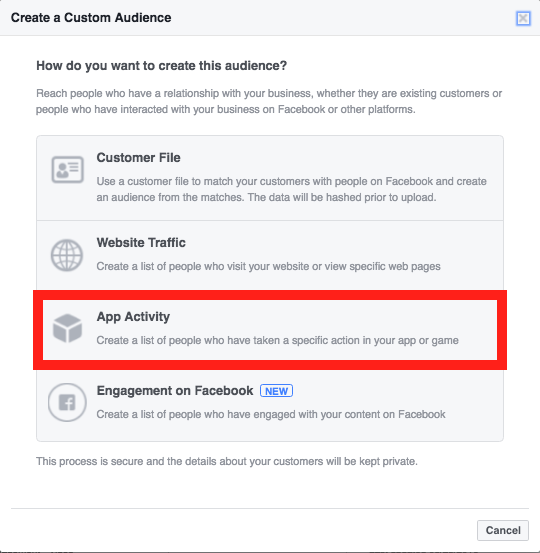 After you register your app with Facebook, you'll need to set up app events for iOS or for Android to reach users taking specific actions (called “events”) within your app. Your app will send “events” via Facebook's SDK. You can also combine actions/events taken (or not taken) for some very detailed app activity custom audiences. 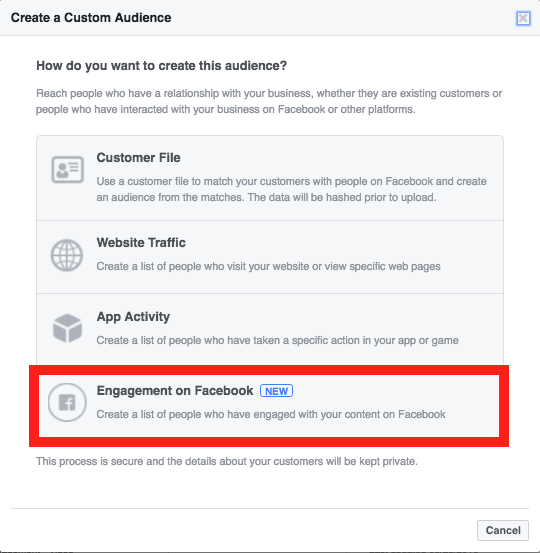 This is relatively new (circa September 2016), and it’s for people who engage with your Facebook page posts or ads. Currently (as of November 2016), you can’t target those who Like, Comment, or Share...but we know how fast Facebook moves, so we do expect this to change soon! Lead Ads Engagement - if they opened your Lead Ad, but didn’t complete it. 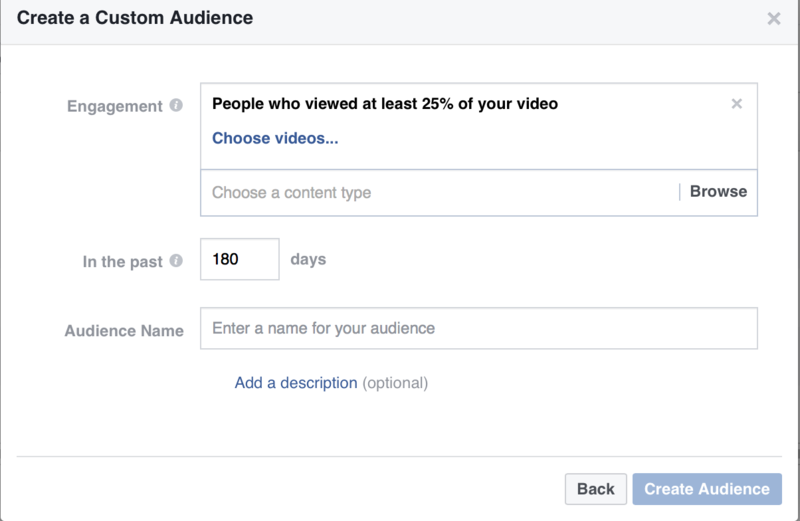 Video Views Engagement - you can target those who watched your video ad based on different durations. 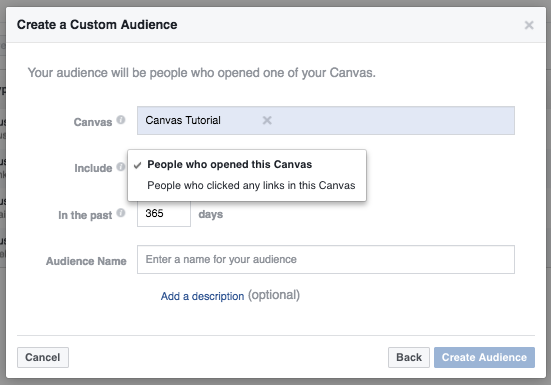 Canvas Engagement - you can target people who opened or clicked links in your canvas ads. While standard custom audiences are great for re-engaging people who already had an interaction with you, lookalike audiences allow you to find hundred of thousands of users that don’t know you yet, but are very likely to become your customers. It’s not hard to guess how powerful this feature can be. For example, you could create a Custom Audience with 10,000 of your customers, and get a Lookalike Audience of 2,000,000 people who are very similar to your customers and ready to be targeted with advertising. The minimum number of people you need to create a Lookalike Audience is 100. You’ll often see that Lookalike Audiences far outperform your interests targeting.